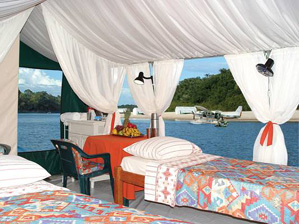 Onboard the amazing floating lodge of River Plate Outfitters! Fishing for Peacock Bass at it's finest! This is simply the most exciting trip we have ever hosted! Fishing for Peacock Bass at it's finest! You get yourself to Manuas, Brazil on the first date listed (we'll help with this).......and we'll do the rest. Manaus is only a 4.5 hour flight from Miami and is in the same time zone! Easy! Our hosted trips are limited to 7 anglers, plus a representative from Mad River Outfitters. We are there to assist and to make sure that you have the trip that we promised you. If you can't make our scheduled trip dates, Mad River Outfitters can put together a trip with these folks for you at any time! 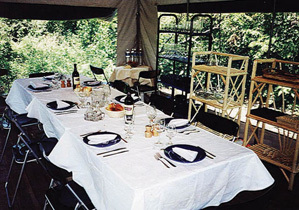 Our prices are always the same as the outfitter.....our booking services are FREE. Fly, Spin and Bait Casters all Welcome on these trips! call us at 614-451-0363 with any questions about these trips! We are very excited to be one of the few booking agents for RiverPlate Outfitters. 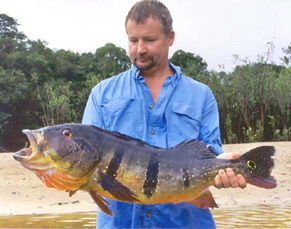 They are the oldest (since 1992) outfitter in the Amazon and, as such, they have the know-how to provide and uparalleled fly fishing adventure! 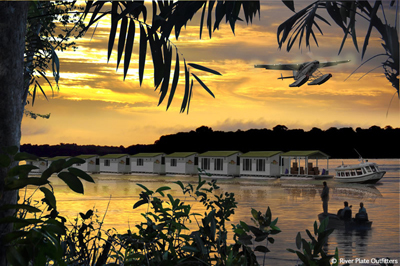 Their operation consists of Fly-In Cabin barges........that's right.....the lodge is a series of barges. 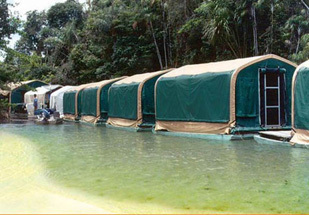 These barges have proved, during their 20+ year Amazon experience, the perfect solution providing mobility, comfort and luxury. Drawing only about 6 inches of water, the small barges are a break-through for navigating over shallow water barriers, away from all fishing pressure! The ability to by-pass natural barriers is the key to exceptional fishing. Although the popular houseboats and yachts offer the mobility needed to consistently find decent water levels, they can only reach the fringe of the really good fishing. The houseboats/yachts and even commercial river boats must stop where low water prevents passage.....and this is where the great fishing starts! River Plate Outfitter's Fly-In Cabin Barges are 4 to 6 hours upriver (even in a super fast bass boat from these fringe locations). And although many land-based lodges are situated at these natural barriers, they become rapidly overfished 2-3 hours upriver or downriver. River Plate's barges however, can move freely to unfished river segments.....so you can start the day casting from your room! Each two-angler bedroom barge has a steel structure 8' X 15' room, fully carpeted wooden platforms, 4-ply insulated roof, fully screened walls and aluminum entry door, shower bathroom, standard sized beds, air conditioning, 220 volt electricity etc. The caravan consists of 9 barges: Five bedrooms, One 18' X 10' dining/sitting lounge, One host quarters, One kitchen and One staff bedroom. Below is an what is and what is not included in the trip. If you have any questions or would like further information, please see River Plate's website and/or give us a call at the shop! * please note that this is a trip that is geared towards fly fishing but we are not going to turn our nose up at the possibility of throwing bait casters if needed or desired.......just to be clear on this. 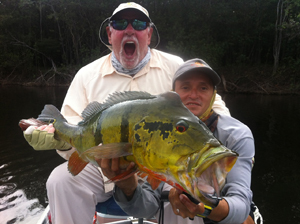 We welcome all types of anglers and methods on these trips. Upon sign-up, you will receive further information on tackle and fly recommendations, flight info, visa info and the like! 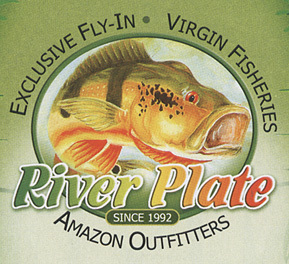 Mad River Outfitters serves as a full booking agent for RIVER PLATE OUTFITTERS and will be happy to assist you in booking the trip of a lifetime for Peacock Bass whether it be on one of our hosted trips or one that we put together especially for you and your group! Please contact us if you have any questions whatsoever and thanks for reading! Click Here to see photos from the Previous trips! click here to see a ton of information on these trips at River Plate Outfitters! We love to talk Peacock Bass and will be happy to help in any way that we can! Click Here to Pay or Deposit for a Trip Online!